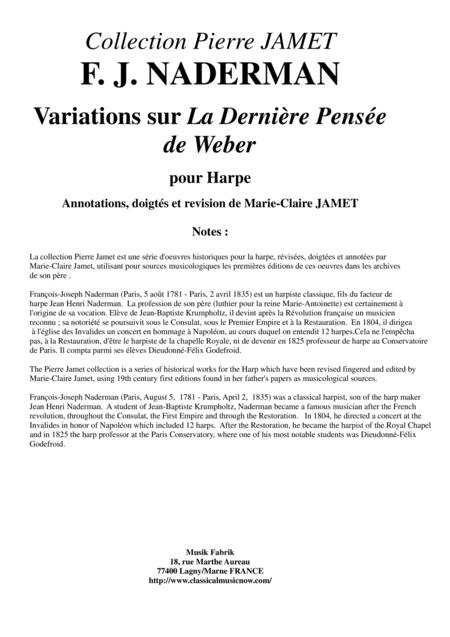 The Pierre Jamet collection is a series of historical works for the Harp which have been revised fingered and edited byMarie-Claire Jamet, using 19th century first editions found in her father's papers as musicological sources.François-Joseph Naderman (Paris, August 5, 1781 - Paris, April 2, 1835) was a classical harpist, son of the harp makerJean Henri Naderman. A student of Jean-Baptiste Krumpholtz, Naderman became a famous musician after the Frenchrevolution, throughout the Consulat, the First Empire and through the Restoration. In 1804, he directed a concert at theInvalides in honor of Napoléon which included 12 harps. After the Restoration, he became the harpist of the Royal Chapeland in 1825 the harp professor at the Paris Conservatory, where one of his most notable students was Dieudonné-FélixGodefroid. 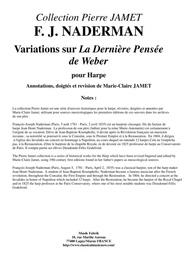 About Marie-Claire Jamet: After having earned her First Prize in Harpe and her First Prize in Chamber Music from the Conservatoire National Supérieur de Musique de Paris, Marie-Claire Jamet was the Principal Harpist with the Orchestre National de Radio France, and then First Harp Solo with the l’Ensemble Inter-Contemporain under Pierre Boulez. She now has an active career as a International Harp Soloist.Marie-Claire Jamet has given more than 2000 concerts in the US, in Europe, in Japon, in Indian, in Russia, in Canada, in Australia etc...She has given premières of many works for Harp and Orchestra, Flute and Harp and Solo Harp, including works by: Banquart, Boulez, Damase, Françaix, Ishi, Lesur, Ton-That Tiët, Taïra etc... and has played under the diretion of such noted conductors as Munch, Bernstein, Célibidache, Ozawa and Pierre Boulez with whom she performed the Danses of Claude Debussy notably at the Salzbourg Festival and at the Scala de Milan Opera House.From 1981 to 1995 she was the professor of harp at the C.N.S.M. of Lyon then at the C.N.S.M. of Paris was well as at the Ecole Normale de Musique de Paris.Her numerous recordings have won many awards.